Cervical radiculopathy is the damage to a nerve, while cervical radiculitis is irritation to a nerve that results if one of the nerve roots near the cervical vertebrae is compressed. 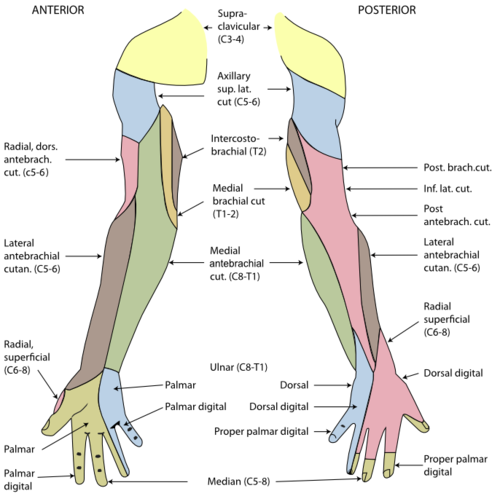 This can cause pain and the loss of sensation in various upper extremities, depending on where the damaged roots are located. Because the spinal nerves branch out to other areas of the body, symptoms can be felt in other places besides the location of the affected nerve root. Depending on which nerve root is affected, you may feel pain in the arms, chest, neck, or shoulders. Other symptoms can include numb fingers and weak muscles in the arms and chest. What tests diagnosis Cervical Radiculopathy/Radiculitis? History and Examination – this is often the most neglected, yet, by far the most important part of the diagnosis process. Quoting Sir William Osler MD, "Listen to your patients, they are telling you the diagnosis”. It is absolutely crucial to spend the time taking a detailed history.” You cannot find what you do not look for, if you do not look for it”. It is absolutely crucial to spend the time performing a detailed exam. Based upon the results, a determination will be made as to whether to begin treatment or to order further tests. X-Rays – used to check for bone health, degenerative changes and structural alignment. We will be able to see the space that the nerve occupies, but spinal nerves will not show up on an x-ray. Cat Scan(CT) – can be used to see a stenotic canal, however it is better suited to visualize bone. While less expensive than an MRI, it exposes patients to high levels of radiation. Generally not the test of choice. MRI - this is the gold standard test to determine an irritated or compressed cervical nerves. It will clearly show the nerve root and the amount of space in the canal, in addition to all the soft tissue structures. While this is an excellent test, there are inherent problems as well. First is the cost, which can be as high $2000 Second, is that the time to perform the test is about 30-45 minutes and you must lie still. This may be very difficult for many patients. Third and most importantly, is that most often, the findings that the MRI shows may have nothing to do with the presenting condition. Studies have shown that many asymptomatic people, who have never had any back/leg pain, will show compression of the sciatic nerve on an MRI.. This does pose a diagnostic dilemma and is why you have to “marry the patient to the MRI, not the MRI to the patient”. Again, the history and examination will determine treatment going forward, in spite of the MRI findings. EMG/NCV – EMG this is called electromyography. 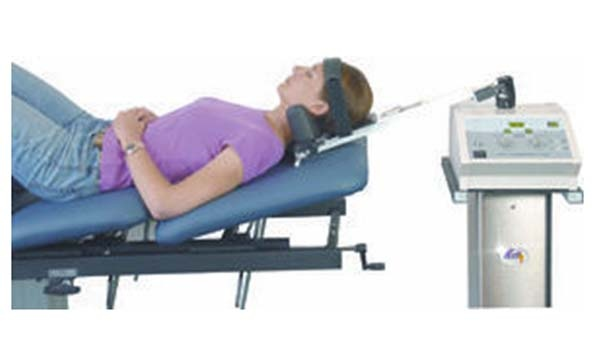 It measures the electrical activity of muscles at rest and during contraction. NCV is called nerve conduction velocity. It measures how well and how fast the nerves can send electrical signals. Nerves control the muscles with electrical signals called impulses. These impulses make the muscles contract in specific ways. Nerve and muscle problems cause the muscles to contract in abnormal ways. With arm pain or numbness, you may have these tests to find out how much your nerves are being affected. These tests check how well your spinal cord, nerve roots, nerves and muscles that control your arms are functioning. What treatment can help Cervical Radiculopathy/Radiculitis? While there are certainly many different types of treatment, that are effective for cervical radiculopathy/radiculitis, many of which we readily use in our office, namely spinal manipulation, electric muscle stimulation, ultrasound and spinal exercises, it is not the intent of this article to list all of them but simply to introduce you to a type of treatment that you may not be aware of. SDT is not meant to necessarily replace any of the above therapies. In fact, utilizing them can be very helpful and will often enhance recovery. As a stand alone therapy or as an adjunct to pre-existing therapies, STD can be extremely effective to help you get well. 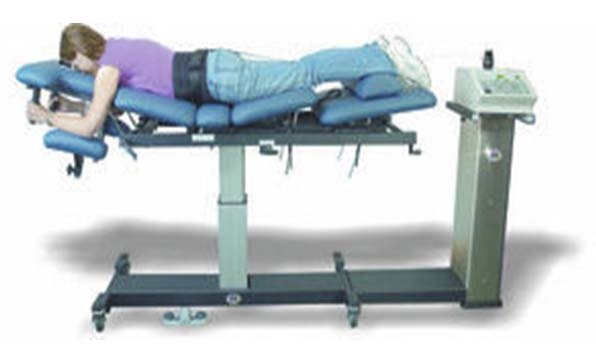 Spinal Decompression Therapy is FDA approved and has a very high success rate for pain associated with herniated discs, spinal arthritis (DDD), spinal stenosis and sciatica .…even after failed surgery. 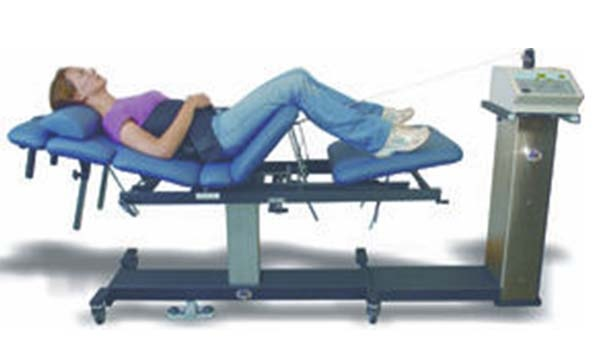 It is a non-surgical, traction based therapy for the relief of back/leg pain or neck/arm pain. During this procedure, we have the ability to cycle through distraction and relaxation phases and by a proper patient positioning, a spinal disc can be isolated and placed under negative pressure, causing a vacuum effect within it, drawing it back from its herniated position and away from the nerve. If your condition is not discal and is secondary to arthritis, which can lead to spinal stenosis, we can change the parameters to focus on a more continuous shorter hold/relax phases, creating a “milking of the joints”. This will help to reduce inflammation and allow diffusion (absorption) of nutrients into the arthritic areas to lubricate and heal the irritated structures.